All the evidence suggests that Mohandas Gandhi today is more keenly followed outside of India than within. He has been appropriated by western concerns. Within India he has become more of a figurehead, so much so that even right wing and communal political movements such as the BJP see fit to claim him as one of their own. Within this configuration a very real question is raised, just where does the real Gandhi come from? Are we right to claim him as a sympathiser of western liberal and progressive causes? Or should we not rather search for an explanation of Gandhi in terms of his Indian and above all Hindu background? Of course at the outset we can recognise that Gandhi belongs to both west and east but it remains important to raise the question, where should the emphasis lie? The approach of this essay is historical and it will address just a few of the extensive recent publications on Gandhi. Just how impressionable was the young Gandhi who arrived in London in 1888 at the age of 18 to the cultural life of the imperial capital ? He was clearly exposed to what we can now see as the beginnings of a lively alternative culture. In all kinds of ways English intellectuals were reacting against a dominant Victorian culture. Doubt was corroding old values and into the vacuum all kinds of new beliefs were flooding. Historians by describing Gandhi’s encounter with these new beliefs suggest that Gandhi became a part of this western counter-culture and could be claimed as one of its own. Indisputably Gandhi was attracted to the new vegetarian movement, fell on the vegetarian restaurant, the Central, he discovered, in St Bride’s street with delight and relief, read Henry Salt’s pamphlets, though at this point Henry Salt did not become a significant friend, but did befriend Josiah Oldfield and became an active member of the London Vegetarian Society. But the degree of exposure to Theosophy is more contentious. We know that two Theosophists, Bertram and Archibald Keightley, uncle and nephew, asked him to help them in their study of Hindu texts and this was Gandhi’s first encounter with the Bhagavad Gita as a text (it had been read out to him as a child), that he read Madame Blavatsky’s A Key to Theosophy and that he was won over by the oratorical power of Annie Besant when he heard her lecture on ‘Why I became a Theosophist’ at the Queens Hall and of her commitment to pursuing the truth. He met both Blavatsky and Besant at their home in 17 Lansdowne Road, Notting Hill. 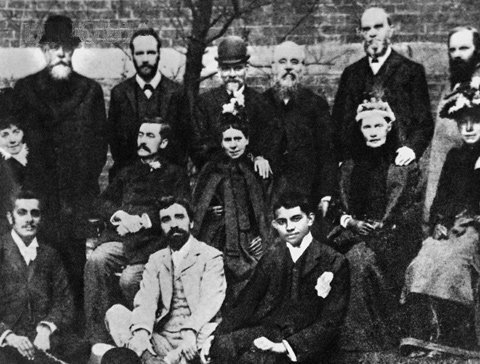 Fascinatingly, Annie Besant had only just converted to Theosophy and was embarking on yet another of her incarnations, though this was to be a lasting one, in her varied life and the young Gandhi was equally at the outset. There was much that Gandhi might have learnt about Besant at the time. Her commitment to Indian self-rule had already been expressed in articles on England, India and Afghanistan she wrote for the National Reformer in 1878 and her love affair with Hindu India was already of long standing. Quite what he made of her rather notorious reputation, her being divorced, her support for birth control, her earlier atheism, we do not know, though intriguingly he was sufficiently in love with English liberalism to support the right of one vegetarian to at least publish an essay supporting birth control. But one wonders if this attempt to connect Gandhi with these expressions of an alternative culture is not the root of the misunderstanding between Gandhi and the English left. This is part of a larger story which has been thoroughly explored by Nicholas Owen in his The British Left and India: Metropolitan Anti-Imperialism 1885-1947 (OUP 2007). Within this relationship lies a key question, raised above all by Edward Said, to what degree was this British protest shaped by an Indian input, in Said’s cultural terms, was an expression of hybridity? Owen’s study reveals the extent to which British critics of imperial rule tended to project onto the Indian situation the kinds of concerns that shaped their own struggles and expectations of reform with the British context. They constantly came up against the limits, ‘buffers’ is Owen’s word for it, of their grasp of the Indian situation. In the early days of Congress, set up in 1885, Indian liberals accepted the need for a pressure group to be set up in London to influence metropolitan attitudes, and subsidised the British Committee. However tactful British liberals might be there was always a tendency for British liberal sympathisers of Indian reform to impose their own values on India, and if not quite a neo-con type agenda, there was always a tendency to talk down and tell Indians that the liberal constitutionalism path was the one for them. This was a paternalism that was to become increasingly resented. But were you to Indianise the nationalist movement, would it become even less familiar? And here of course was the further beginnings of the misunderstanding of Gandhi. He failed to fit into western expectations of Indian socio-economic and political development. But to explain why we have to explore the way Gandhi’s outlook evolved, and initially on his attitudes to religion before we tackle the nature of his political leadership. The validity of other faiths would be found in working alongside, in the constructive programme, for example. (See pp51-4). Christians in South Africa tried to convert him but he could not accept a Christ as an exceptional incarnation of God and was resistant to the idea of atonement; man, Gandhi felt, must redeem himself from sin. Conversion was unacceptable; we have to pursue our religious path in the faith into which we were born. Anthony Parel has radically reorientated our understanding of Gandhi by demonstrating how his real quest was to live out the Hindu values of dharma, artha, kama and moksha. (See his Gandhi’s Philosophy and the Quest for Harmony, CUP 2006, in The Gandhi Way No 95 Spring 2008 and I will not repeat its arguments here.) Parel’s originality lies in the claim that Gandhi privileged artha and sought in politics the means of salvation. Clearly Gandhi was heading in an entirely different direction to western politicians. Only by situating him in the context of the Hindu Renaissance and the Religious Reform movements (not wholly interchangeable concepts) will Gandhi make sense. He was horrified to discover that protagonists of violence were trying to highjack that ideology. This was why his encounter in London with Savarkar, exponent of a violent form of Hindu nationalism, was so disturbing to him and prompted his longest text after the autobiography, Hind Swaraj (1909). He had to demonstrate that adopting the culture of violence was simply to ape the culture of the west and that the only truly Indian path to independence lay through ahimsa or non-violence. All through the years in South Africa he was aware of the Hindu Renaissance working its way out in India. He was to contact some of the religious reform movements. In 1901 in Calcutta he contacted the Brahmo and Sadharan Samaj’s, the liberal and radical wings of the Hindu reform movement inspired by Ram Mohan Roy. He tried to visit Vivekananda, leader of the Ramakrishna Mission, but he was too ill at the time and indeed died in 1902. Here was a figure who must have provided Gandhi with a role model as social reformer and political patriot. But the figure who must have loomed the larger was Aurobindo. You need luck to become a political leader and Gandhi was to be spared the rivalry of Gokhale and Tilak by their deaths in 1915 and 1920 respectively. Annie Besant, never a serious threat, had peaked by 1917. But Aurobindo was always there and, had he not chosen to go into internal exile in Pondicherry in 1910 and divert his extraordinary powers of leadership into an internalised yogic quest, it’s hard to see how Gandhi could have outmatched him as leader. The religious reform movements had been reluctant to engage in politics, largely out of fear of the repisals from an overbearing colonial state. But Mrs Besant believed she was released from Colonel Olcott’s agreement to keep the Theosophical Society out of politics by his death in 1909 and did become actively involved. For Gandhi it took the massacre at Amritsar in April 1919 to release him from his curious sense of loyalty to the Empire – he still acted as a recruiting sergeant for the Indian army throughout the war – to take up the leadership of Congress and to embark on his campaign of non-cooperation. This is where the originality of Parel’s interpretation comes into play. Gandhi was the one Indian religious reform leader to see politics as the way to salvation or moksha. How did British politicians respond to this new style Indian leader? Oddly, Gandhi invited him to be a steward of his house in Durban in 1896 only for Mehtab to be caught in flagrante with a prostitute. Admittedly Mehtab joined in the 1908 satyagraha in Johannesburg but a lesson had been learnt. You should not fully trust a friend. I think Gandhi always held something back, friends should not become too dependent, they had to work through to their own salvation. There was an inner austerity, almost cold in its character. This story of misunderstandings has, of course, an obvious moral for our times. Can we be sure that we do not project onto Gandhi our own Gandhian perspectives? Are we sure Gandhi would have endorsed our own ideals? Would he, for example, be supportive of our variants of a multi-faith world where we are tolerant of conversions from one faith to another? I think we have to live with a Gandhi who was clearly intolerant of all forms of sexual permissiveness and of alternative sexualities. Maybe, whether or not our ideals can be shown to be truly Gandhian, the point Gandhi would make is the need for us to be absolutely sure that we have internalised these and they have become part of our own pursuit of the truth. Gandhi cannot become a crutch and ours has always to be a personal struggle. Antony Copley is Honorary Senior Research Fellow in the School of History at the University of Kent. His most recent publication A Spiritual Bloomsbury (Lexington Books: 2006) has been republished by Yoda press, New Delhi under the revised title of ‘Gay Writers in Search of the Divine’. Currently he is working on a book on art, music and spirituality in the 20th century. That was really cool! I am fascinated that a man could even tolerate not being violent, especially because I learned that he was a thief when he was a teenager.